My seven-year-old daughter is teaching me how to plot. 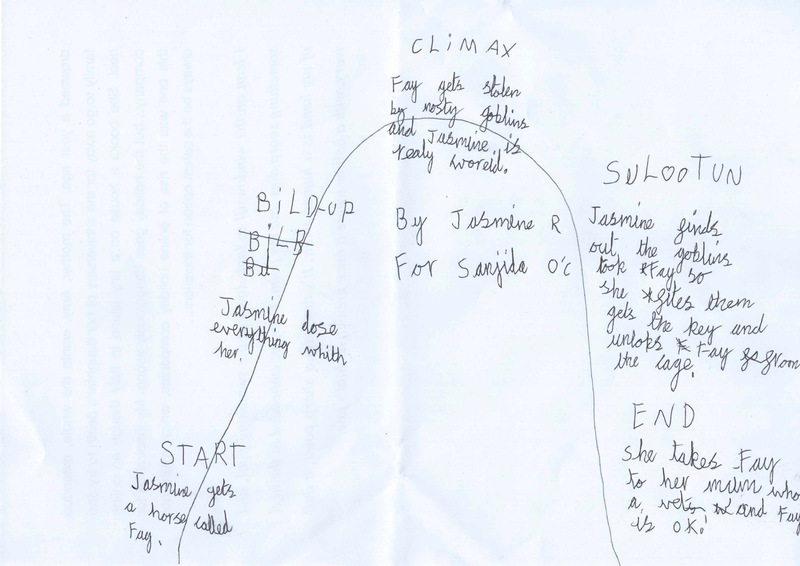 She’s drawn a story mountain for me, which shows the start, build up, climax, solution and the end (she’s obviously inherited her ability to spell from her mother). She’s broken down the key elements of a story she’s writing to demonstrate how it works. It’s about a girl called Jasmine whose horse is stolen. Jasmine follows hoof prints in the mud, and discovers a broken robot in a ditch with ‘Dr Evil’ stamped on it. With the help of her friend, Summer, they mend Tim the robot, and he leads them to Dr Evil’s house. Dr Evil has enslaved a group of robots and they’ve been collecting prize animal specimens from around the world on his behalf. The girls free the robots and they help them release all the pets. Obviously, it needs more work, but if I hothouse my daughter a bit more, she might keep me in prosecco in my dotage! But actually, the story mountain is a pretty good way of thinking about plot (in fact, I do ‘plot’ my stories on a graph before I start writing, although I know that sounds completely nerdy!). Even at such a young age, my daughter, pretty much like every kid can do, has captured the key ingredients for a story: a beginning, a middle and an end. Plus there’s a hero – Jasmine, and a villain – Dr Evil. Her story also features some other essential characters: the friend and mentor (Summer); villains who become friends (the robots); victims (the animals, especially the horse, Faye) and a mentor figure (the mother, Sanjida, who is a vet and in the final scene checks that Faye is unhurt). Faye is the symbol of ‘desire’ in the story that motivates the characters: both Jasmine and Dr Evil want Faye, albeit for different reasons. The story also has some other essential elements: an inciting incident, a crisis and a climax – more on these shortly. What I think every story needs are at least three acts corresponding to the beginning, the middle and the end (although, you can of course have multiple acts). In the beginning section, you need an inciting incident: this is the event that forces our protagonist to act – or decide not to act – but is what starts your story. Think of Nick Dunne in Gone Girl by Gillian Flynn finding his front door open, his living room turned upside down, and discovering that his wife, Amy, is missing. We immediately think: What has happened to her? What will he do? There is then a crisis, which is often described as the worst point for the protagonist; it’s a seemingly inescapable predicament or insurmountable dilemma. In the final act, there’s a climax, which could either be a showdown with the antagonist or could be internal – the main character battles with his or her internal predicament. If the inciting incident is – what will happen?, the climax is the unexpected but inevitable result of the opening event – this is what happens. The ending is the resolution, which ties up loose ends and lets us see how the dust is going to settle. Fairy tales and children’s stories often begin, Once upon a time, and end, happily ever after. And although readers tend to want a story to finish on an emotionally satisfying note, an open, unhappy and/or uncertain ending can also provide closure, even without the happy ever after. 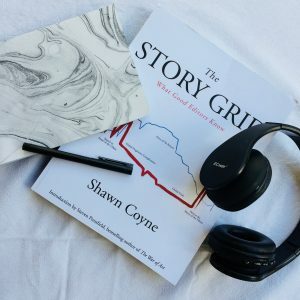 I’d highly recommend Story by Robert McKee and The Story Grid by Shawn Coyne for more detailed discussions on how to plot. 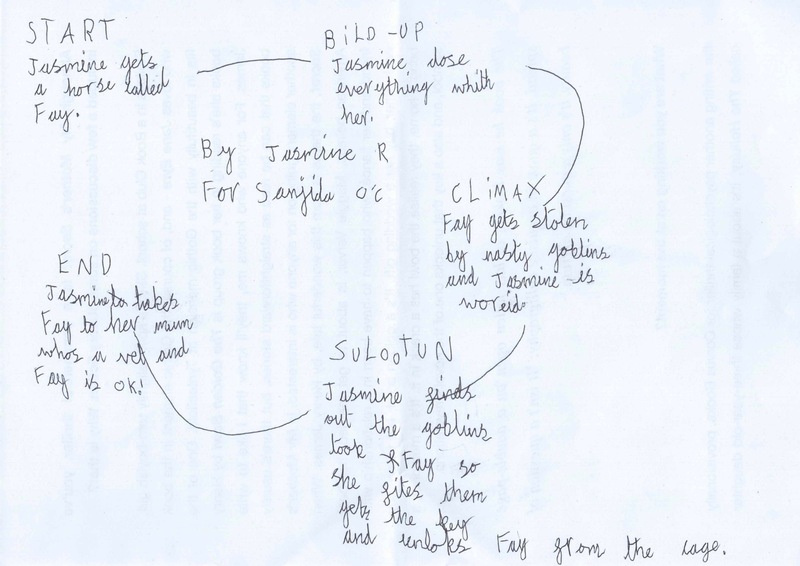 And in the near future, I’ll do a breakdown showing how I plot my novels.